does anyone kn ow where this piece is displayed, does anyone have more information? is it genuine? H. Russell Robison says the armor was "assembled in 1934 from pieces said to have been found by Lake Trasimene." That's *said* to have been found... No telling what the date might be, though there's nothing I can see that would prevent the scales from being Roman. The pieces at the shoulders, neck, and armholes may be pure guesswork, or modern fabrications. This is in the Royal Ontario Museum in Canada. The helmet is a fake, I'd say. Maybe Victorian, but not Roman. It is supposed to be in the Royal Ontario Museum, Canada. Here is a link to some info on these items from the museum. Scales that large are usually used on horses. They probably didn't come from a corselet. The neck and shoulder pieces don't belong. Here are photos I snapped of it and the displayed description a couple of years ago. Aha! Thanks guys! Presumably that all happened since Robinson was published. Good to know the ROM is on top of things. 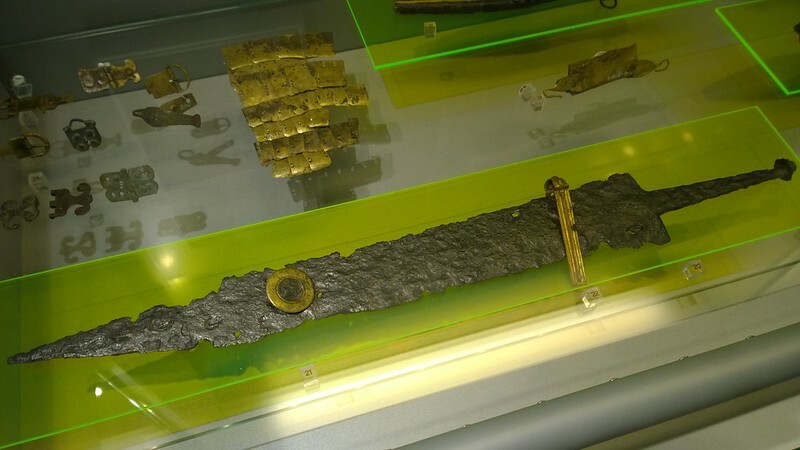 Hey, why aren't all those *real* Roman scales in the display case? Do a search for Syrian scales. There's probably 50 pages of scales here. Nice link, Len! A search for "armor" yields over 1400 hits. 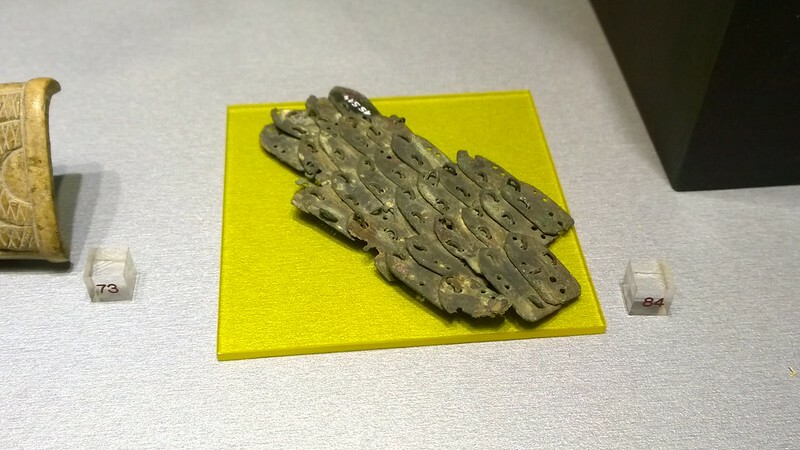 Actual Roman scales from the museum (Allard Pierson Museum, Amsterdam) where I work. For a sense of "scale": it's the middle patch in the background of picture 2. Sadly I have no info other than that it's Roman. 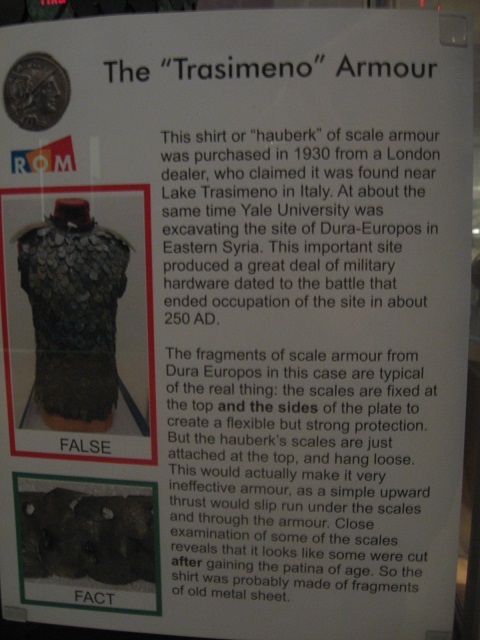 Speaking of, I saw two examples of Roman "scale armour" (I would argue both examples appear to be lamellar) at the Archaeological Museum of Zagreb a few months back... 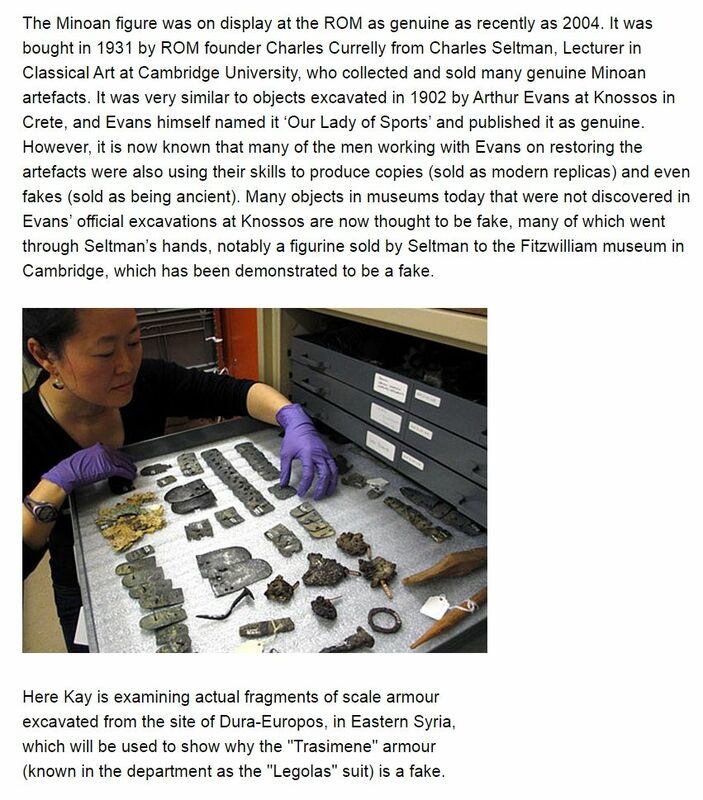 The following information is presented on museum display cards. "Scale armour, Sisak (Siscia), 1st century AD"
"Scale armour fragment, Sotin (Cornacum), late 2nd - 3rd century AD"
The Trasimeno armour, nicknamed the Legolas armour for having scales just like the armour worn by Legolas (Orlando Bloom) in the Lord of the Rings and The Hobbit films. No one knows who the original wearer is until now. Roman legionaries don't wear such thing, though. The early 3rd century a.d. Roman scale fragment from Carpow, Scotland still attached to linen twill backing, 6-holes per scale. Awesome. That looks a lot like the example I posted from Sisak. I bet this was rather attractive stuff... I don't research Roman reenactment much any more, so can't say whether there are people out there reproducing this sort of scale with accuracy. Would be neat to see! Nobody wore such a thing. This armour is either a dodgy reconstruction or a fake. I guess that's the truth behind the Trasimeno armour. 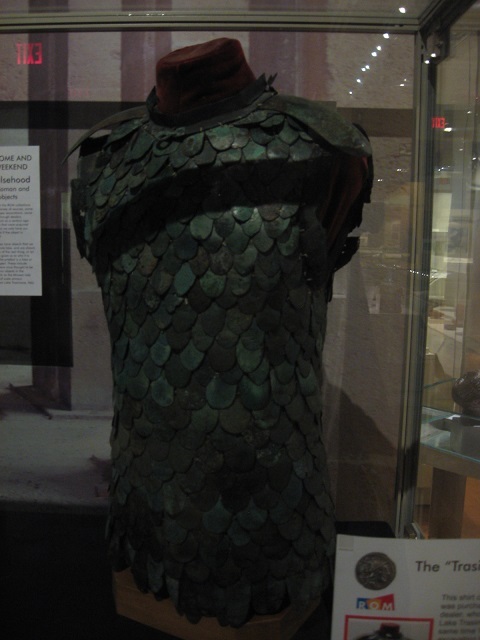 This armour from the ROM had been known to be an incorrect attribution to the Roman army for a while. At least for 2 or 3 years. They seem to keep it there out of embarrassment. Are we sure it is not used by a non roman group Dan? Do you think in art when they have such depictions they are just artistic style? I think he only meant this particular cuirass! "Dodgy" is a good word for its size and construction.